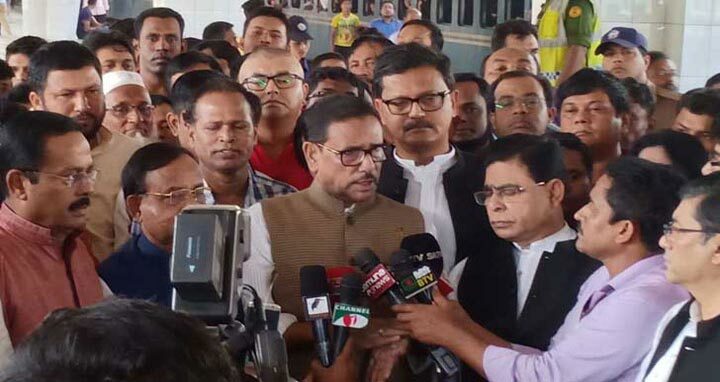 Dhaka, 8 September, Abnews: Awami League General Secretary and Road Transport and Bridges Minister Obaidul Quader and other leaders started visiting different districts in the northern region by rail on Saturday morning. Their journey began from Kamalapur rail station towards Nilphamari by Nilsagar Express train at 8.00am. Quader is accompanied by AL leaders Jahangir Kabir Nanak, Dr Hasan Mahmud, Asim Kumar Ukil, Ahmed Hossain, BM Mozammel Haque, Abu Sayeed Al Mahmud Swapan, Khalid Mahmud Chowdhury, Barrister Biplab Barua and Anwar Hossain. They are set to address street rallies at railway stations in Tangail, Sirajganj, Pabna, Natore, Bagura, Joypurhat, Dinajpur and Nilphamari districts.